Correction of negative influence on the wine and restoration its sunny, earthy and lunar energies – this is the role of SOMMELIER COUNTER like an energy harmonizer. The sommelier counter is most funny of the series harmonizers. 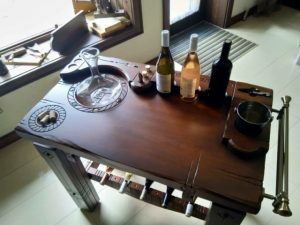 For a very first time in the world is made an instrument for the sommelier and an accessory for wine connoisseurs. 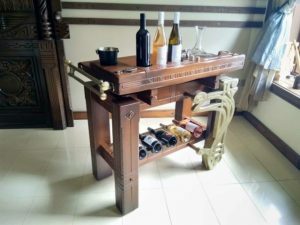 Like an art furniture-woodcarving the sommelier counter can be an accent in home interior, the restaurant, the winery or tasting room. 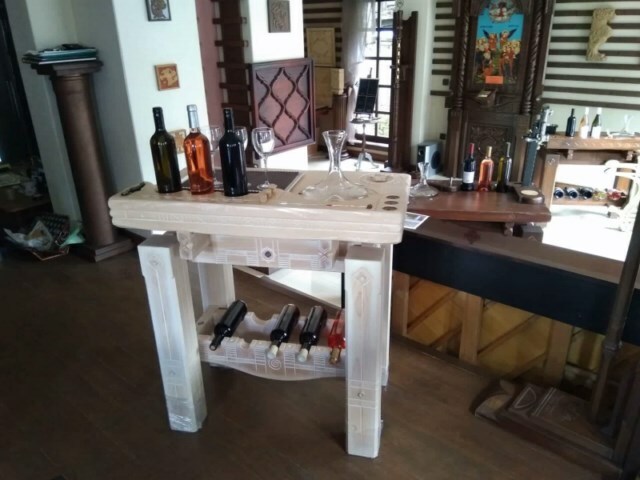 Its dimensions are designed so that on minimum area to be organized all necessary for preparing wine consumption or tasting. Height of 92 cm creates comfort in use. The countertop is 97,5 x 54 cm with two levels and a fixed place for the corkscrew. 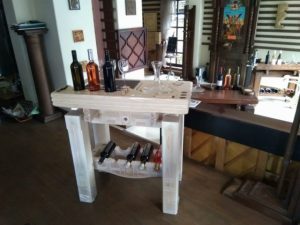 There is a place for corks of opened bottles and also places for decorative conical corks closing the desired bottles. 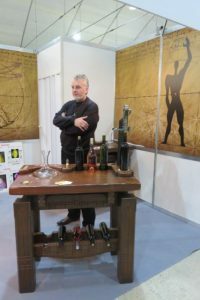 There are fixed places for a thermometer and alcoholmeter, for one decanter and for three bottles of wine for tasting (for example – white, rosé and red). It`s thought about the candles too. On candles` light it`s possible to inspect the dregs of wine in the bottles, not to fall in the decanter or wine glasses. For every single thing – one place and every single thing on its place! 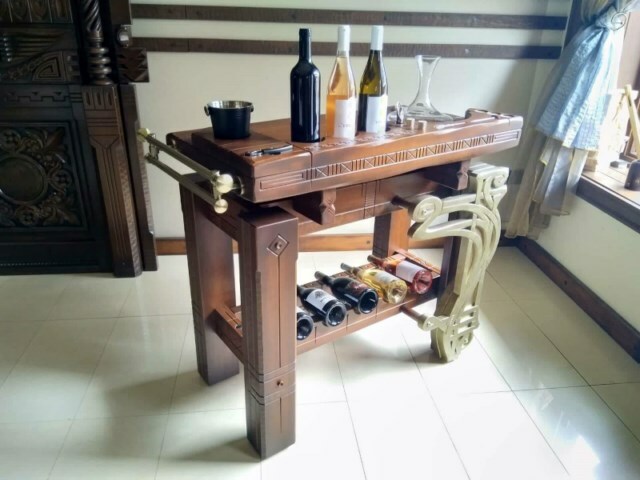 A new kind of furniture – an sommelier`s instrument. An accent with art value in interior. Archaeologists still wonder what exactly was the role of the stone baths in the Thracian sanctuaries? In these stone tubs the wine was oxidizing and extracting energy value in its contact with the stone crystal structure (Earth), cleaned of the Moon, illuminated and loaded of the Sunlight. 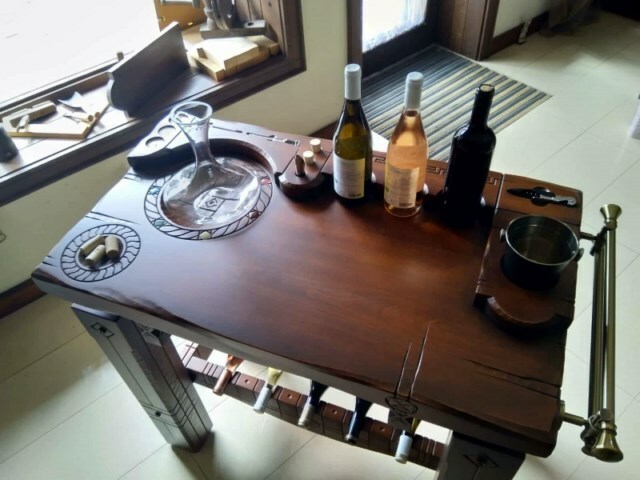 Here is the idea – to influence the wine in a manner analogous to that used in Thracian sanctuaries, but conveyed in space of urban city environment. Let`s then come back to Sommelier counter! The place of decanter is fixed like wood carved womb, moon, female nature. 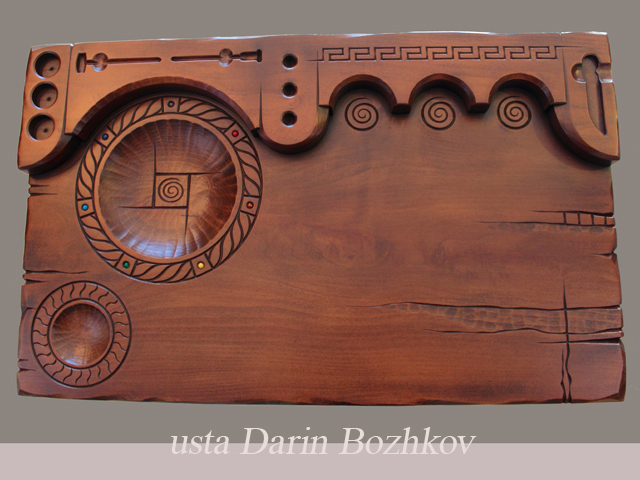 It`s carved directly on the countertop of solid beech and width of 64 mm. There are seven semiprecious stones in rainbow colors around it (the lithosphere)! 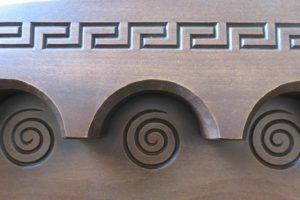 DYNAMIC SQUARE sign is carved inside too with right direction of rotation – the suwastika (a symbol of the Sun and male nature). At the underside of the countertop along the axis of the sign is built in unique mountain milk crystal BAGARAN – protector against energy contamination. 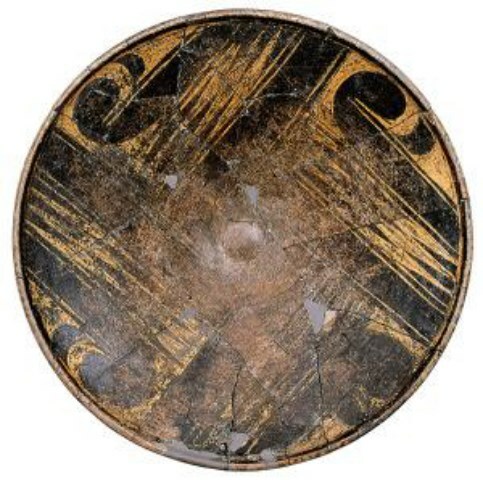 The Dynamic square – we can see it 7500 years back in the time, from the treasure at the Varna necropolis (the oldest processed gold in the world). The same shape, the same symbol – a dynamic square, suwastica or “Tryavna shasharma”. The wine in the decanter dissolves its fragrances and taste qualities but also the wine receives energy value. 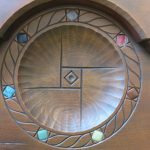 It structures itself under the influence of the energy field, created of the carved wood, with defined of the suwastika (the solar sign) direction of rotation, increased and protected of semiprecious stones and Bagaran crystal. It`s thought also for the wine doesn`t using decanter. 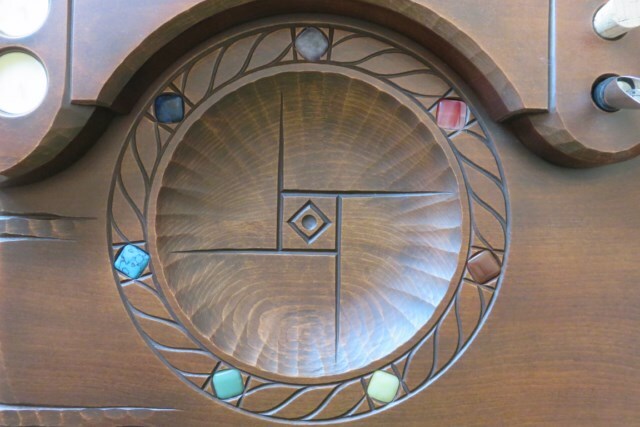 On the places for bottles on the countertop are wood carved solar spirals and under them are built in Bagaran crystals. Solar spirals, Orphic Meander in Space rhythm three times in three. Here the wine in the bottles on the countertop is harmonizing. Even the wine is made with a lot of love, while it comes to us, on the road from stores, transport and shops, it receives influence and stress of hundreds of people. (See The hidden messages of water – Dr Masaru Emoto). SOMMELIER COUNTER categorically harmonizes the wine flavor. Corrects negative influence on it and recovers its sunny, earthy and lunar energies. Created with mood! With inspiration from antiquity and feeling for modernity! 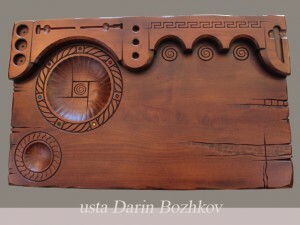 Made of an artist-woodcarver, built in his sensitivity by rhythm of wood and hammer in handmade signs and ornaments! Tough beech wood – the material for counters. A construction giving the wood a possibility to “breathe”. Surface treatment with ecologically clean oils. No choice except to try it and then comes the funny part. The Sommelier counter was presented at the Exhibition Vinaria 2018 in Plovdiv and received a diploma for design of the exposure. The jury president, acad.prof. 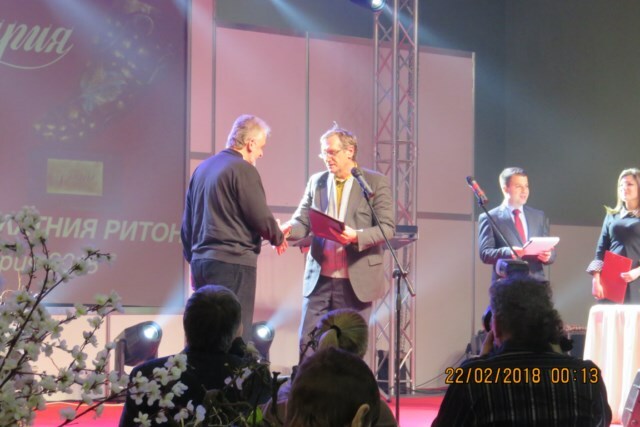 Sasho Draganov, gives up the award to usta Darin Bozhkov. 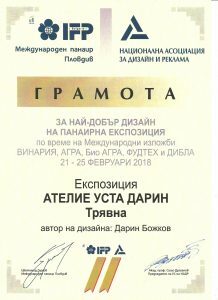 The diploma for design of the exposure.